As I mentioned last May, we found water in the rudder and had it repaired. Since then I've been reading up on rudders and water in the rudder. It seems like it is very common for rudders and skegs to get water in them. Some folks will say water in the rudder is a sure sign of upcoming disaster, others say it's par for the course. Rudders usually have a part foam core and part solid glass layup. This combination results in a more lightweight rudder then you'd have if it was solid glass. 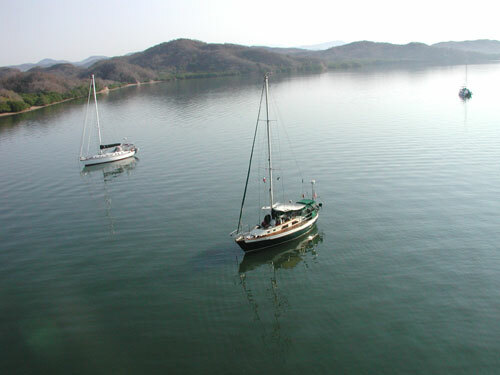 Near neutral buoyancy helps the performance of the boat and makes it possible (not easy, but possible) to remove the rudder without hauling out. Over time, water gets into the foam, steel, and glass core through small cracks in the glass. As the boat bumps along the gulf stream the rudder goes up and down in the water and the pressure on the surface of the rudder changes. This creates a vacuum inside that will pull water in through the smallest crack. Inside the rudder you'll find two to four steel web tangs welded to the rudder shaft (or stock) running aft. These help transfer the turning effort to the rest of the rudder. 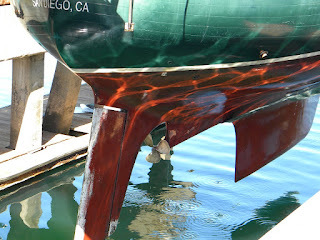 The interface (weld) between the rudder stock and these tangs can rust over time if water is present there without oxygen. Hence this connection area should be properly glassed when the rudder is assembled. 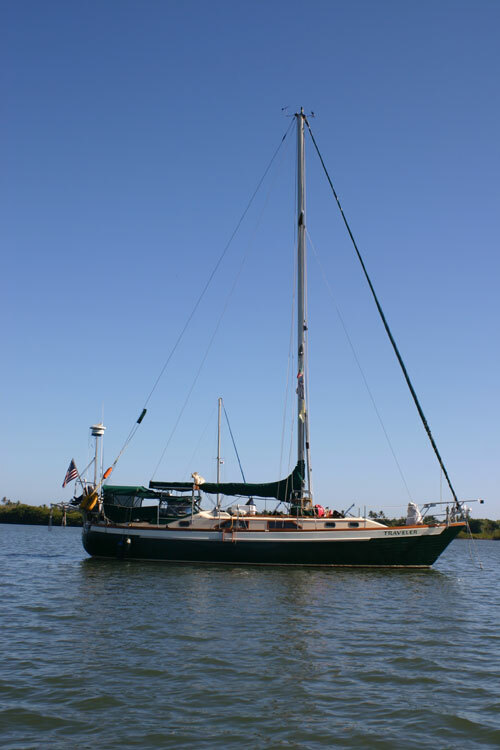 When we hauled Traveler I knew we had some delamination in the top part of the rudder because the surveyor had tapped around and found a hollow sounding area. Ovidio cut out a square in the fiberglass skin so we could inspect the area. He also drilled a couple of holes in the bottom of the rudder and that's when the water started coming out. I tried not to freak out when I saw this. Ovidio also drilled a hole in the bottom of the skeg and water drained out there also. I've heard, and it makes sense, that if the water is rusty colored then duh, you've got rusting steel and the connection of the tangs to the stock might be compromised. The water draining out of Traveler's rudder was not brown but light amber. And there was not more than a cup coming out anyway, which is common for many rudders. People up north have a problem with water in the rudder because when they haul out for the winter the water in the rudder can freeze and cause delamination. Go look in a boatyard in upper Michigan in the winter and you'll see rudders puffing up left and right. Another reason why it is crazy to live up north. After draining the water out of the rudder and skeg and letting it dry for a few days, Ovidio patched up the side of the rudder where he cut out the inspection area, then he re-glassed the rudder and skep, stopping up the drain holes of course. Do I have water in my rudder now? You betcha. Am I worried about it? Just a little. But the consensus on water in the rudder is that it's like lecherous thoughts. Most every sailor has some. And this is yet another reason why we should have a Hydrovane self-steering system mounted on the stern. It can be used as an emergency rudder for when my waterlogged rusty rudder drops off the boat and down into the murky deep. Note: Rowena is a Formosa 41 topsail ketch formerly skippered by my friend Rebecca and now being sailed by Live Ocean, a marine conservation group in Kirkland Washington. Here it is March and we've gotten over a major hurdle. I've not only sold the house but sold some land I owned in Sequim WA. Now we have cruising kitty! This is not a good time to sell real estate, but when is a good time? We all thought we had a gold mine in our properties till the housing bubble burst. I was able to get out of all my properties with enough to buy the boat and have a little cash to cruise on so I consider myself fortunate. Fortunate indeed! 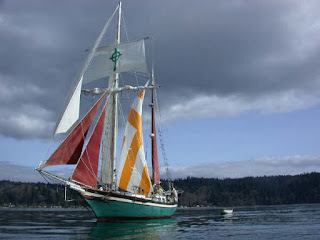 Today I sent out an email to a bunch of my sailing friends here in Seattle, telling them of our plans, and seeing if any are interested in meeting up with us later to help out with long crossings or just to hang out near a warm Mexican port. Since we are cruising on a shoestring, we thought we'd offer a weeks worth of sailing in exchange for some supplies. Crew can fly down to meet us, donate a week's worth of groceries (think wine), top off the diesel tank, and have a leisurely relaxing week on the clear blue warm waters off the coast of Mexico. 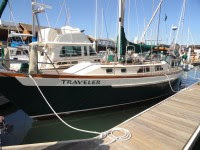 You will have your own private quarters and opportunity to sail, snorkel, cook, tan, eat, drink, and play music. 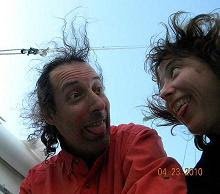 Connie and I are very excited about this next phase in our lives and are keen to share our adventures with our friends. The clock's a-tickin.